Choose to live healthy with NutraVigour Organic Wheat Grass Powder. 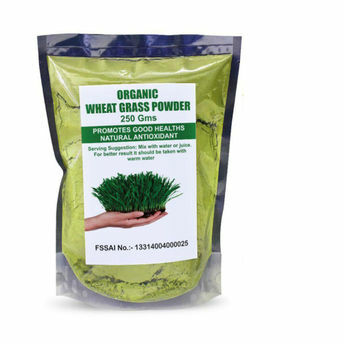 Enriched with the goodness of Wheat Grass juice, an effective healer it contains Minerals and Vitamin A, B-complex, C, E, I and K. Extremely rich in protein it contains 17 amino acids, the building blocks of protein. 3 wheatgrass juice contains up to 70% chlorophyll, which is an important blood builder and a superior detoxification agent. Contains the goodness of Wheat Grass juice. Enriched with Minerals and Multi-Vitamins. Superior detoxification agent and blood builder. 17 amino acids in it are building blocks of protein.